...to go watch a movie. 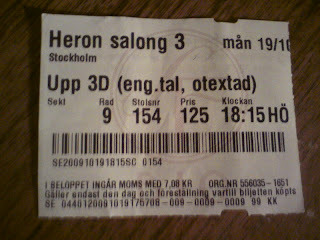 "Up" did not disappoint, but I thought it was rather sad for a children's flick...or maybe that's just me. I think this is the first 3D movie I've watched that's 3D throughout (save for that deep sea documentary narrated by Johnny Depp and Kate Winslet) and at some point you just sort of get used to it and cease to be aware that it's 3D. Or did I just miss the prompt to remove the glasses?